Plants about 1 meter tall growing as a garden weed. Eldoret, Kenya. January 2012. Ray Flowers: ALL of the florets are strap-shaped like rays. Some around the perimeter of the head may be a little larger. 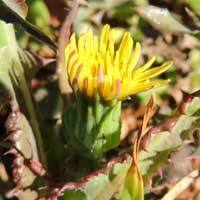 Disc Flowers: the shorter strap-shaped florets at the center of the head appear similar to disc florets. 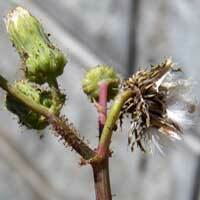 Phyllaries: tall phyllaries enclose the florets and close even tighter as the seeds develop - small image at right. Pappus: a dense fluff of cottony filaments top the seeds aiding in wind dispersal. Notice in the image at right that a dense barrier of gland-tipped hairs are set below the developing seed head. Crawling insects intending to feed on the seeds may have difficulty reaching the seeds. 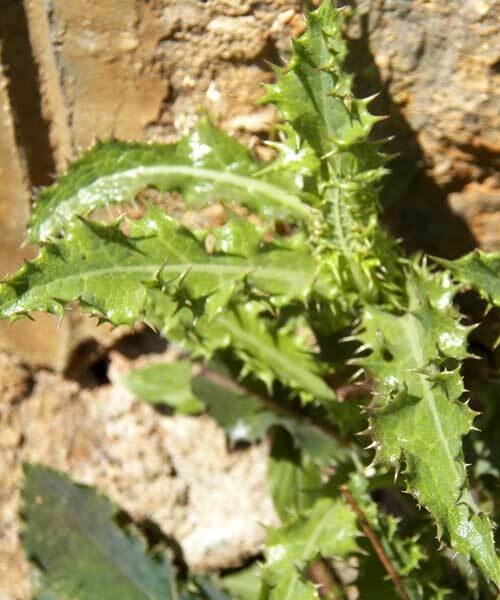 Leaves: The simple leaves broadly elliptic with larger teeth that are margined with spiny smaller teeth. The largest leaves are clustered around the base.